Professor Steve Granick's team from the Center for Soft and Living Material, within the Institute for Basic Science (IBS) at UNIST. The work by Professor Steve Granick has been published in the September issue of Advanced Materials. Our world is made up of moving, vibrating and leaping molecules, yet capturing their movement has been an easy task. A new study by an international team of researchers, affiliated with UNIST has announced that they have succeeded in observing the movement of molecules stored inside a graphene pocket without the need to stain them. This study has been conducted by a research team, led by Professor Steve Granick (School of Natural Science, UNIST) of IBS Center for Soft and Living Matter. Published in the September issue of the journal Advanced Materials, the study paves the way for observing the dynamics of life building blocks, like proteins and DNA, as well as the self-assembly of other materials. One third of the diameter of a human hair is approximately the smallest size human eyes can see unaided. To distinguish tinier objects, we need microscopes. We can appreciate cells and bacteria with optical microscopes, while viruses and molecules are visible only under an electron microscope. In the latter, images are formed by electrons shot onto a sample. As electrons have a much shorter wavelength compared to light, electron microscopy provides a much higher magnification than optical microscopy. However, the electron beam destroys the sample and if water is present, it tends to decompose into bubbles. Therefore, electron microscopy is suitable for visualizing inert, dead samples, while living material is chemically locked in place. The graphene pocket. 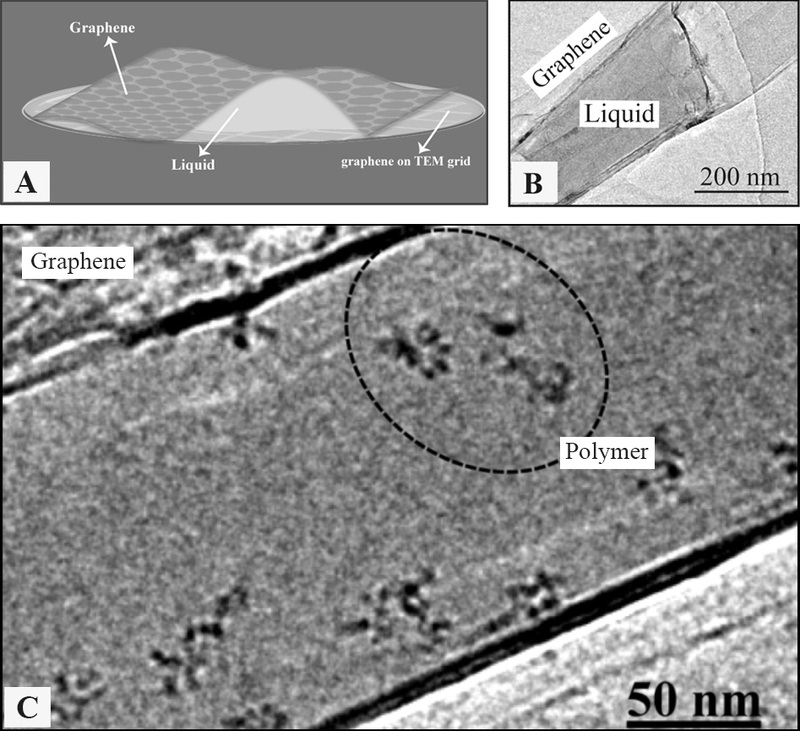 IBS scientists produced thin but robust graphene pockets (top) in order to visualize moving molecules under a standard transmission electron microscope (TEM). The graphene layers contain the sample and also protect it from the electron beam for an average of 100 seconds. The electron microscope image (bottom) shows the individual molecules of polystyrene sulfonate (red circle). Credit: K. Hima Nagamanasa*, Huan Wang*, and Steve Granick. Liquid-Cell Electron Microscopy of Adsorbed Polymers. Advanced Materials (2017) Copyright Wiley-VCH Verlag GmbH & Co. KGaA. Reproduced with permission. IBS scientists broke this rule and visualized non-fixed chains of atoms, called polymers, swimming in a liquid inside graphene pockets. These consist of 3-5 graphene layers on the bottom and two on top. The sheets are impermeable to small molecules, and also prevent the electron beam from instantly harming the sample: the scientists had an average of 100 seconds to admire the dynamic movement of individual polymer molecules, before these were destroyed by the electron beam. During these valuable seconds, molecules change position, rearrange or “jump around.” “It was amazing to watch these flexible organic macromolecules dancing around,” says Hima Nagamanasa, first co-author of the paper. “Molecules move much more quickly in bulk. Previously, scientists needed to stain samples with metal or dye molecules to make them visible inside the graphene pocket. Metal has high reflexibility, meaning it can shine, so it can be used to get good images. However, the chemical bonds between the sample and the metal or dye changes the characteristics of the sample molecule. In this study, the graphene pocket is thin enough that its content can be observed in real time without any staining. In particular, the scientists worked with two polymers: one with sulfur, polystyrene sulfonate, and one without, polyethylene oxide. This allowed them to show that the contrast under the microscope comes from the polymer structure — made of carbon and hydrogen atoms — rather than from the sulfur. “Most molecules produced by living organisms have a backbone made of carbon and hydrogen, and that’s why we hope to extend this research to the study of interactions between DNA and proteins,” explains the first co-author Huan Wang. 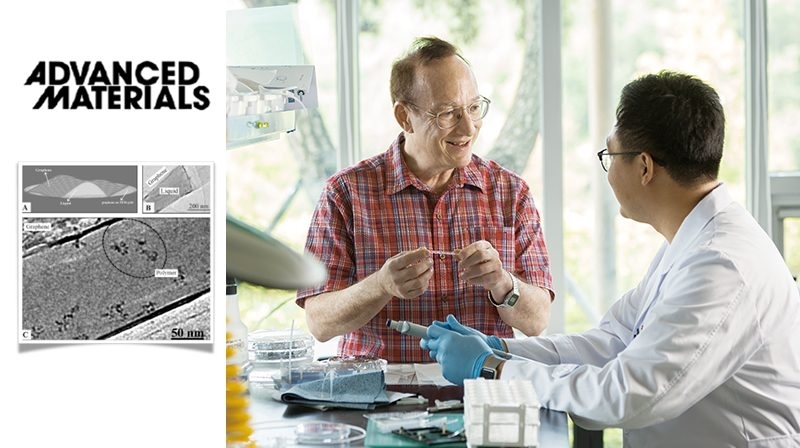 Moreover, since the scientists used a standard electron microscope, they expect that this technique will be used in other laboratories.